“The Grange Is...an organization where friendships are formed and fun could be had for the young and young at heart. It's also a place where members are always ready to lend a helping hand to those who need it.” The above was written by Helene Forrest of Hillstown Grange. 1. Ron Purington & Dan Mutchler representing Lyme Grange and New London County Pomona. 2. Mary Turner and Robyn Lee representing Cheshire Grange and New Haven County Pomona. Next up is “Let’s Celebrate” on July 26th. Our Photo Contest will be held at this time. Please check the Bluebook for details. Photos should either be mailed ahead of time or be brought to Good Will Grange Hall that morning between 9:00 a.m. and 10:00 a.m. The Connecticut Bristol Old Tyme Fiddlers will be entertaining at 2:00 p.m. followed by the announcement of all the different departments winners and refreshments. DIRECTIONS ~ Just a reminder… The Putnam Bridge between Glastonbury and Wethersfield is scheduled to still be closed heading toward Glastonbury. For those coming from the west - follow I84 through Hartford across the river. Then take exit 55 (New London - Norwich). This is Route 2. Follow this to exit 6 in Glastonbury. (Griswold Street) At the end of the exit ramp go right on Griswold Street. At the next light take a left onto Main Street. You will see Katz Hardware on your right. It is on the corner of Naubuc Avenue. Turn right and the hall will be on your left. 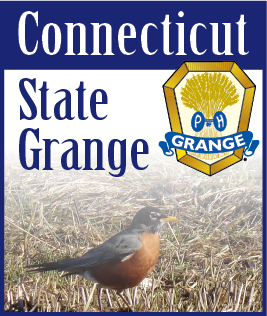 After “Let’s Celebrate” it will be time for the North East Grange Lecturers Conference in Farmington, Maine. If you havenít sent your application in yet, you need to hurry. There is a strict deadline of July 10th. Our program is on the color orange. As soon as I know who is going, I will be in contact with everyone to be in the program. Remember this is not my program, it is Connecticut’s Program. I want everyone who attends to be a part of it.